The Board of ICANN today gave final approval to the most dramatic change to the Internet in four decades — allowing the expansion of new Top-Level Domains (TLDs). This monumental decision will allow companies and organizations to turn their own brands into Internet domain extensions (that is .brand) or to create broad generic strings such as .CAR, .SPORTS or .BANK. ICANN's TLD expansion plan was first announced three years ago on June 26, 2008 at the 32nd ICANN Meeting in Paris. The ICANN board members voted 13 for, 1 against, 2 abstain during its 41st international meeting currently underway in Singapore. "ICANN has opened the Internet's addressing system to the limitless possibilities of the human imagination. No one can predict where this historic decision will take us," said Rod Beckstrom, President and Chief Executive Officer of ICANN. "Today's decision will usher in a new Internet age," said Peter Dengate Thrush, Chairman of ICANN's Board of Directors. "We have provided a platform for creativity and inspiration, and for the next big dot-thing." ICANN in it's official announcement said today that it will soon begin a global campaign to tell the world about this dramatic change in Internet names and to raise awareness of the opportunities afforded by new gTLDs. Applications for new gTLDs will be accepted from 12 January 2012 to 12 April 2012. "I fully understand that trying to do it exactly right and particularly trying to hold things up to get things exactly right, is exactly the wrong thing to do." 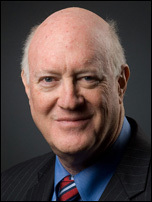 –Steve Crocker, ICANN Board MemberICANN has indicated that it anticipates between 300 and 1,000 new TLDs could be created under the new program, providing an alternative to existing TLDs such as .com or .net. Steve Crocker, ICANN Board Member, in his remarks during the board session said: "Many people will write positive and negative things, I'm sure. I hope that this is studied in business schools going forward and analyzed in many ways. And we'll look back and try to understand what the results were compared to what we expected. And I think that's a very healthy process. But having been involved in a series of key decisions along way from the very beginning, I fully understand that trying to do it exactly right and particularly trying to hold things up to get things exactly right, is exactly the wrong thing to do." According to Melbourne IT Digital Brand Services, ninety-two per cent of the 150 organizations which have expressed interest to the company about applying for a new Top Level Domain (TLD) indicated their preferred choice would be their core brand name, or a ‘.brand’. (For example: Canon has publicly stated they will apply for ‘.canon’). A further 11% indicated they were interested in applying for a generic term as a TLD (example generic names could be .bank, .hotel and so on). Whoo Hoo! Congrats on getting this passed after six years of trying. Did ya catch the timeline that calls for this to go into effect in the year 2014!!! Do ya think .COM will have solidified its lead by then — as if it hasn't already?!?!? Seems obvious to me that this morning's big winner was .COM. 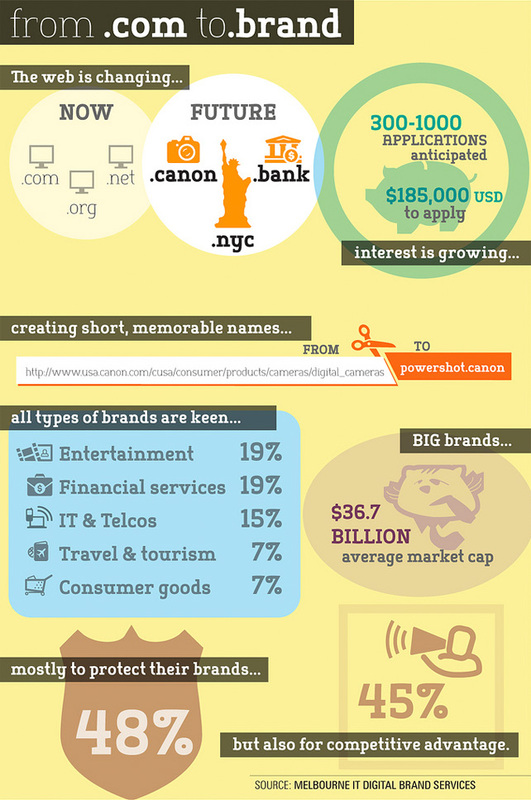 If Canon can end their domain with .canon, it removes the need for .com. This is big for brands. You'll no longer goto apple.com, you'll goto home.apple and ipad.apple. The category specific domains are pretty short of being successful. There are some good combinations that spell words, but other than .me its hard to find a good mainstream use. With paid tlds, companies will be able to create their own extensions and close the loop. you'll goto home.apple and ipad.apple. ...I wonder whether those blobs of text will "look like" something that can be typed into a web browser. Most web browsers these days will automatically check the search engines if you type something that is not a valid DNS name. Some browsers even check the search engines if you leave off the "http://" now. As an experiment I just typed "home.apple" and "ipad.apple" into my web browser and I got exactly the results that Apple would like me to get. Apple did not have to spend $185K in GTLD application fees to make this work, and I think Apple can count on trademark controls to prevent anyone else from registering their name and thus maybe stealing some of their eyeball traffic. See also Domain Names Without Dots. I think congratulations are in order for ICANN. In one bold step, they've created the need for a whole new specialty in the practice of law - TLD property rights. Just what we all needed - more lawyers. By the way, regarding your last paragraph, since when did "Apple Corporation" assume trademark ownership of "apple" (the "word")? Trademark law is usually applied to the "way" a word is depicted as opposed to the word itself - except in cases where someone is trying to impersonate the trademark name as their own. Oh, well, more work for the lawyers (grin). Type in the following - ICLOUD.APPLE - and see what comes back on your browser. If you end up at an Apple site, watch out. iCloud Communications, an Arizona VoIP provider, has just sued Apple for trademark infringement of its "iCloud" name. Lawyers are already at work on that one - and they may need more lawyers to resolve TLD issues. But, I'm certainly not willing to mortgage my house to get that TLD (grin). And I doubt if many small domain owners like myself would do likewise. In short, these changes seem to benefit only the multinational corporations and multinational organizations with the money (and possibly stupidity) to make these new TLDs click. And in my opinion, they're welcome to them (grin). ... but not unless they could capitalize the first TLD letter. But woe be to an infidel who grabs the last two TLDs. They'd probably be subject to a fatwah. In my 4th paragraph, I mentioned the 4 "phase2trek" domains I own. The 4th domain has a .US TLD (I mentioned .NET twice). I agree with the notion that a zillion TLDs is probably not going to end global warming or bring on world peace. In fact in cases like .christian it is likely to engender a lot of trouble for whoever has that name and tries to chose who fits or not. One grand idea of the internet is to let people do stupid things or to build walls around themselves - as long as the harm and isolation they cause is mainly confined to themselves and their willing (and voluntary) adherents. But we need to allow stupid ideas - because sometimes they aren't so stupid after all. Sometimes what seems like a stupid idea - like the idea of 140 character messages - takes off and, in retrospect, seems like a good idea. Back in the late 1960's there were a lot of people in the telephone companies who thought that packet switching was a stupid idea. It's a good thing that that opinion was not able to deny birth to what became the ARPAnet and eventually the internet. + Every person shall be free to use the Internet in any way that is privately beneficial without being publicly detrimental. - The burden of demonstrating public detriment shall be on those who wish to prevent the private use. - Such a demonstration shall require clear and convincing evidence of public detriment. - The public detriment must be of such degree and extent as to justify the suppression of the private activity. My complaint about ICANN is that it has set such a high hurdle that large interests are favored over individuals - the filing fees are too high and most of the criteria that are used to chose among the applicants are criteria that are based on social engineering, trademark protection, and protection of incumbent registries and registrars - in other words, the kinds of things that work against innovation and imagination and, instead, create stasis and slowly turn the internet's naming system into something as lifeless and unimaginative as the 1950's US telephone system - an era in which the greatest innovation was the Princess phone. So all in all I am happy that ICANN is moving forward with new top level domains. I do hope, however, that ICANN does remember that it has unfulfilled applications, applications for which ICANN received $50,000 each, lingering from year 2000. ICANN has been holding those applications as "pending" and ought to deal with those, and deal with them on the terms that existed when those applications were made, before allowing any newer applications. thirty years ago I listed a few network laws from experience that time did prove. The first one is : "whatever is fun, money making or detrimental to someone will be attempted". This is exactly what happens today: it is fun to see ICANN deciding something so detrimental to them in the hope of some money making. Actually, ICANN voted the end of ICANN and the @ $10 iuTLDs (IUser TLD). Now the only question are : how long will it take, and what will be the user reward in getting rid of the US ICANN and in spuring a distributed technology through the single authoritative virtual root matrix deployment. Yeah it's really for the big brands. I don't think the avg person will pay $100K per year to have a domain. Local Time: Wednesday, April 24, 2019 08:58 PM PDT – Page Load: 0.9911 Sec.